Azzam S Al-kadi, MD FRCSC, Tyrone Donnon, PhD, Elizabeth Oddone Paolucci, PhD, Philip Mitchell, MD FRCSC, Estifanos Debru, MD FRCSC, Neal Church, MD FRCSC. Department of Surgery, Faculty of Medicine, Qassim University, Saudi Arabia. Department of Upper GI and Laparoscopic Surgery, Peter Lougheed Center, Calgary, and Department of Community Health Sciences, Faculty of Medicine, University of Calgary, Canada. There is increasing interest in using simulators for laparoscopic surgery training, and simulators have rapidly become an integral part of surgical education. We searched MEDLINE, EMBASE, Cochrane Library, and Google Scholar for randomized controlled studies that compared the use of different types of simulators. Criteria for inclusion in our meta-analysis included all peer-reviewed published randomized clinical trials comparing simulators versus standard apprenticeship surgical training (no simulation) among surgical trainees with little or no prior laparoscopic experience. Of 551 relevant studies, 17 trials fulfilled all inclusion criteria. The effect sizes (ES) with 95% confidence intervals [CI] were calculated for multiple psychometric skill outcome measures. Data was combined by means of both fixed and random-effects models. Meta-analytic combined effect size estimates showed that novice students who trained on simulators were superior in their performance and skill scores (d = 1.73, 95% CI: 1.15-2.31; P < 0.01), were more careful in handling various body tissue (d = 1.08, 95% CI: 0.36-1.80; P < 0.01), and had a higher accuracy score in conducting laparoscopic tasks (d = 1.38, 95% CI: 0.30-2.47; P < 0.05). 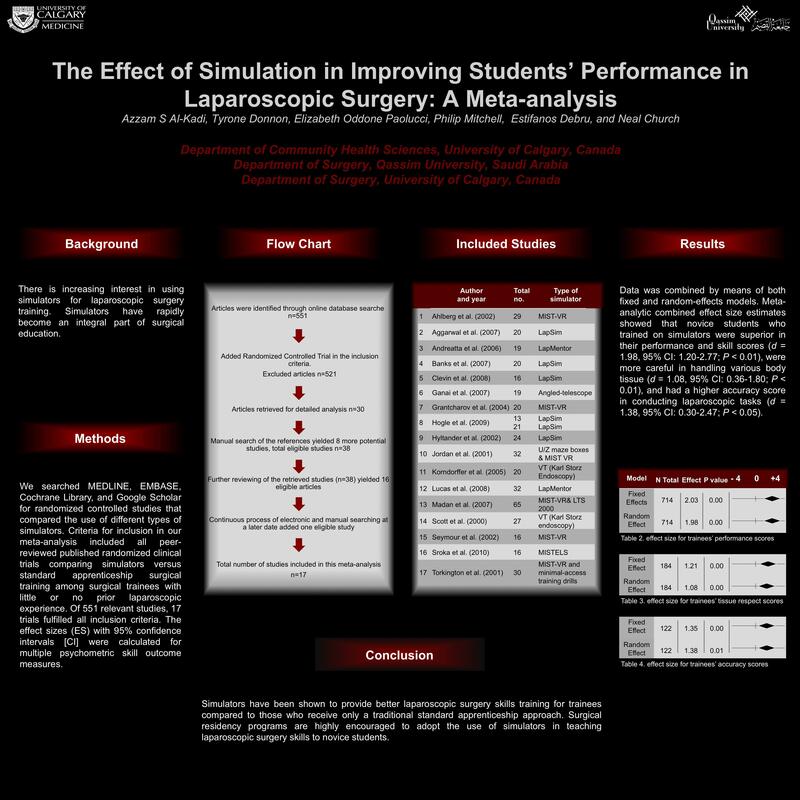 Simulators have been shown to provide better laparoscopic surgery skills training for trainees than those that receive only a traditional standard apprenticeship approach to skill development. Surgical residency programs are highly encouraged to adopt the use of simulators in teaching laparoscopic surgery skills to novice students.